India and Australia have played in many high voltage test matches since the beginning of the new millennium. It is very difficult to pick out the best of the lot. In my opinion, the Mohali test played in the two test series between India and Australia in 2010 ranks the highest. The 2010 series was a short series in duration but was not short of awe-inspiring performances. The India and Australia 2010 series was not part of the Future tour programme of the ICC. If I may recollect, it was added to the calendar in lieu of some ODIs that were to be played between the two countries. But, the test cricket that was played was not an afterthought by any standards. The series kicked off at the famed Mohali stadium with the two teams in full strength. Shane Watson scored a magnificent century, continuing his love affair with India, building on the roaring success he had in IPL with the Rajasthan Royals in the 2008 season. Australia put up a commanding 428 runs in the first innings on the back of Shane’s century and useful fifties from Ricky Ponting and Tim Paine. The first part of the template to succeed in tests in India, is to bat first and put up a 400+ score. Australia did that. 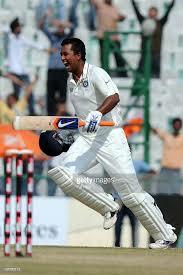 India in reply coasted merrily to 354 for 4 on the back of big fifties from Tendulkar, Sehwag, Dravid and Raina. Mitchell Johnson, then, triggered a collapse in the Indian innings and bundled them out for 405 runs. An important point to note was that VVS Laxman batted at No.10 due to problems with his back. In the third and fourth innings in India, spinners are usually the biggest threat to the batsmen. But since the 2008 series in India against Australia, Zaheer had turned into a big weapon for India with his reverse swing. Zaheer had also become the unofficial bowling captain and had mentored Ishant into an effective ally. The second innings of Australia saw this pair at their very best. Zaheer and Ishant combined to take 6 of the 10 Australian wickets and reduced Australia to just 192 runs in the second innings. Australia gave India a target of 216 to win the test match. Any score above 150 runs makes for a tricky fourth innings chase in Indian conditions. Against a good bowling attack comprising Hilfenhaus, Bollinger and Johnson, which is capable of reverse swing at pace, 216 was a huge target to chase. It turned out to be so. Indian chase got off to a poor start losing Gambhir very early. Dravid, Sehwag and Raina soon followed without making substantial contributions. Australia reduced India to 76 for 5 at the end of the fourth day’s play with Sachin and Laxman at the crease. Sachin carried the Indian hopes, as VVS was hampered by back spasms. On the fifth day, Bollinger and Hilfenhaus bowled beautifully and Bollinger took the wicket of Sachin. India were 119 for 6, when Sachin got out. Australia were the firm favorites at this point. Their odds for a win went higher, when India lost Dhoni and Harbhajan soon after. India were staring down the barrel at 124 for 8. Then, Indian fans got to the see the hitherto unseen side of Laxman. Laxman had played quite a few back-to-the-wall innings against Australia before. But a Laxman battling with physical pain alongside tailenders, was a new situation. Laxman and Ishant combined to produce the match defining partnership that took India’s score to 205. Ishant’s cool head as a batsman is an often unrecognized trait of his. He at times seems more sorted as a batsman than as a bowler! Ishant matched Laxman in that partnership and scored an important 31 runs. Despite this partnership, India still had to score 11 runs with just Pragyan Ohja to give Laxman company. Pragyan Ohja is not a batsman who would give you confidence that he could last a few good overs. At least, if he had taken care of responding to his partner properly, he could have saved himself from Laxman’s abuses. One had never seen Laxman raise his voice at anyone on the cricket ground, leave alone abusing his own team-mate. The tension of the chase was such that even the otherwise calm VVS lost his cool and shouted at Pragyan for getting out of his crease for a non-existent run. Ohja did not stop there. Soon, Indian spectators had their hearts in the their mouth when he missed a ball from Johnson, which hit him on his pads. Billy Bowden, the Umpire, ruled him not out LBW. Ohja did not stop there either. He took off for a very tight single off this same delivery and luckily for him the Australian fielder missed hitting the stumps. Not only did the throw miss the stumps, it also turned out to be an overthrow yielding India four valuable runs. India needed 2 runs to win with Ohja on strike against Johnson. Ohja held his calm this time and played the ball down the legside to score those 2 runs. India won a thriller at Mohali not before some drama and comical moments, courtesy Pragyan Ohja! After the remarkable thriller in Mohali, cricket fans awaited the second test eagerly looking for another thrilling test match. Bangalore did not provide a thriller but was a very good contest to watch. Australia helped themselves by winning the toss again and elected to bat first. The Aussie batsmen were in good form and put together a solid first innings score of 478. Marcus North scored a century to help the cause. Ricky Ponting and Shane Watson chipped in with useful fifties. India, in reply, got off to a bad start losing Sehwag and Dravid early. But the new opener, Murali Vijay and the maestro, Sachin Tendulkar put together a big 300 run partnership and took India to safety. Vijay scored a century and Sachin scored a big double hundred. However, for the second time in two tests, Indian first innings suffered a middle and late order collapse. From 486 for 5, India slumped to 495 all out. So at the end of the respective first innings, the two teams had cancelled each other’s first innings scores. It was over to their second innings to choose the winner, yet again. Zaheer, Sreesanth, Pragyan and Harbhajan combined expertly to stop the Aussies from scoring a match winning second innings score on a flattish pitch. After a poor start with the new ball, the fast bowlers reverse swung the old ball and complimented the spinners admirably. The four bowler shared the wickets among themselves and ended the Aussie innings at 223. India had to chase 207 runs to win the test and the series. The experience of Mohali was on the minds of the players. India started off badly losing Sehwag early. But the newcomer, Cheteshwar Pujara, combined beautifully with the other newcomer, Murali Vijay, to prevent a repeat of Mohali. Pujara and Vijay played positively picking off the Aussie bowlers for boundaries. The chase turned out to be an easy one for India, without the heart stopping moments evidenced in the first test. India won the test match by 7 wickets, quite comfortably in the end.